CITE AS: Flo Laino, "Sir Benjamin Hammet," in 100 Minories, February 20, 2015, https://100minories.lparchaeology.com/sir-benjamin-hammet/ [Date Accessed: April 23, 2019]. 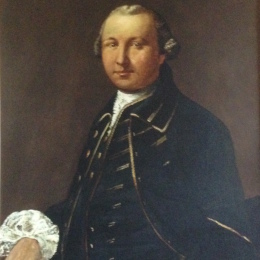 Portrait of Sir Benjamin Hammet. Reproduced with the permissions of Hammet House proprieters. It is to Sir Benjamin Hammet, 18th Century banking mogul and building speculator that we owe the construction of the Crescent, Circus and America Square. Born in Taunton in 1736, to the son of a Taunton Barber, he grew to great wealth, power and celebrity, making his fortune through merchant banking and his development projects. Knighted in 1786 by George III, Hammet held several positions of office, including term as an Alderman of London 1785, Sheriff 1788, Member of Parliament for Taunten, Trustee of the Market House Society. The existing biographical records give an account of Hammet’s advancement as a colourful affair. …[a man] of little education, who as a footman in the household of the usurer ‘Vulture’ Hopkins (John Hopkins of Brittens, Essex) made the conquest of his mistress’s sister, the daughter of Esdaile the banker; and owed his rise as a building contractor and his banking partnership to his father-in-law. The History of Parliament: the House of Commons 1790-1820, ed. R. Thorne, 1986. From this start Hammet proved to be a divisive personality in his time. Whilst an account of him in the Gentleman’s Magazine profiles Hammet as ‘a conspicuous example of the effects of enterprise and industry’, a far more scathing obituary of him in the City Biography attributes him with all the ‘rudeness, ignorance and impudence’ of a man of low education. This perhaps demonstrates the extent to which those such successful socially-mobile parvenus, were received in contemporary culture. One particular instance which may have caused such condemnation of his character, may be traced to an occasion in 1797 , where Hammet, upon being called to London to take up the position of Lord Mayor of London, from his retired residence in Wales, shunned the messenger and the position, and was fined £100 for the whole debacle. However an assessment of Hammet’s political career, may cause us to look more favourably upon his legacy. A supporter of Pitt’s parliamentary reform proposals, Hammet proved a progressive and moderate figure, frequently mediating between banks, local tradesmen and members of the commons. Hammet was also instrumental to bringing about the abolition of the burning of women in England, through the Treason Act 1790.